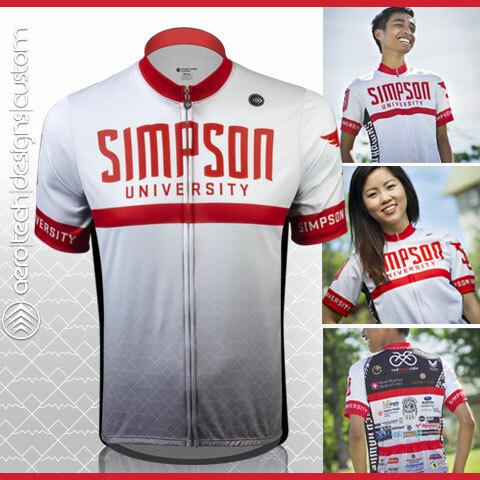 REDDING, Calif. - Nearly 90 cyclists participated in Simpson University’s inaugural Red Hawk Ride, a multi-course ride designed to raise funds for student scholarships. 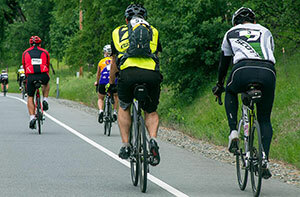 The six-hour event on April 9 drew enthusiastic comments from participants, who chose from routes of 6, 18, 38 or 69 miles that followed rolling hills and straight stretches from Bear Mountain Road to the north to Balls Ferry Road at the southern end. McMullen grew up in Redding and now lives in Mill Valley with his wife and 2-year-old daughter. He rode the 38-mile route with the help of Andy Friesen of Redding, who called out turns and obstacles as they traveled the roads. A pre-ride spaghetti dinner on campus hosted by the Athletics Department included the documentary “The Way Bobby Sees It,” about McMullen’s preparation for and participation in the 2007 Downieville Classic Mountain Bike Race. 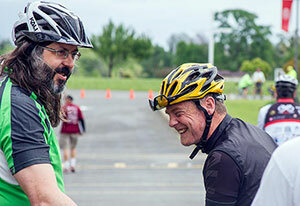 Bobby McMullen of Mill Valley, center, shares a laugh with fellow riders, including Andy Friesen of Redding, left, who guided the visually impaired McMullen on the 38-mile route of the Red Hawk Ride. 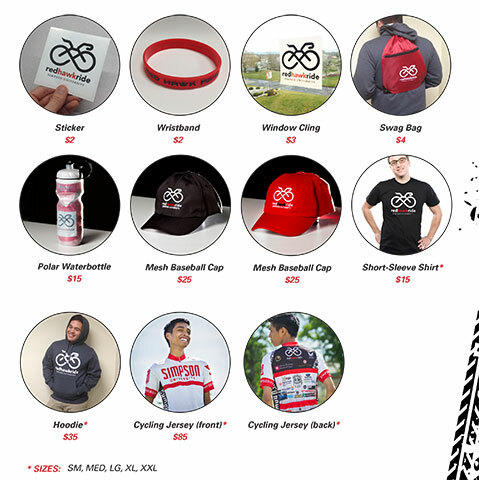 In spite of challenges that include diabetes, vision loss, kidney failure, organ transplants, open-heart surgery, and cancer, McMullen spent seven years as a member of the U.S. Disabled Ski Team, was a two-time U.S. Disabled Overall Downhill champion, and is a nominee to the Mountain Bike Hall of Fame. McMullen has a relative who graduated from Simpson University’s School of Education. He spoke highly of the four-year university’s impact in the North State. “Simpson is an asset to the Redding community,” he said. The Red Hawk Ride included music, breakfast and lunch, and vendors. A few participants opted to run the 6-mile route instead of cycle. 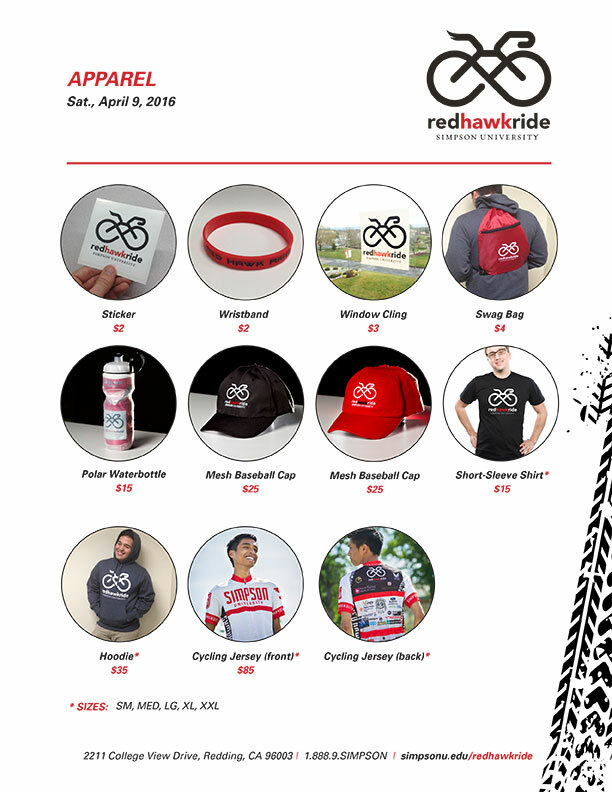 Red Hawk Ride apparel and gear was for sale, and registrants received gift bags containing discount cards, food samples, sunscreen and a cycling magazine. More than 45 businesses and organizations sponsored the ride. Entry fees ranged from $20 to $75, with proceeds going to the Student Scholarship Fund. Sixty percent of Simpson University’s undergraduates are the first in their families to attend college and/or economically underprivileged. The university gives numerous scholarships each year to help students afford a college education. Next year’s event will include an organized run as well. “We look forward to hosting the Red Hawk Ride & Run in 2017,” he said. 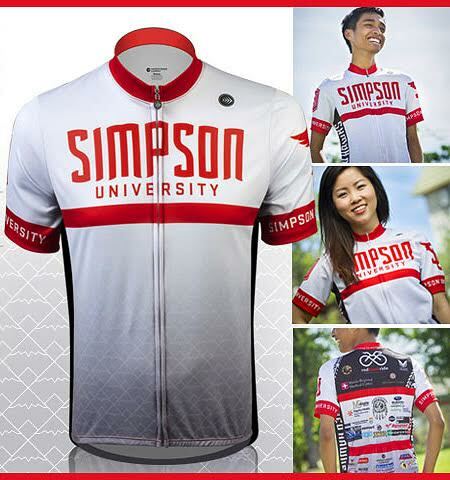 To purchase Red Hawk Ride apparel (pictured below), including the collectible Simpson University cycling jersey for the 2016 ride, call Karen Smith at (530) 226-4177 or email ksmith@simpsonu.edu.